Early buzz on Justice League has been a little mixed. Full reviews are going to be released online Wednesday, but social media reactions have praised a fun movie. There are reportedly story problems, editing issues and some messy CGI. So what's that going to mean for the Rotten Tomatoes score? Sadly, we won't know until just ahead of the release of Justice League as Rotten Tomatoes is withholding the Tomatometer score. Rotten Tomatoes recently launched a new weekly show that airs on social media called Rotten Tomatoes See It/Skip It. It's been revealed that the official Tomatometer score for Justice League won't be revealed until the show airs on Thursday at 12:01 a.m. That means the score won't be available until just hours before the first showings of Justice League being on Thursday night, ahead of the full release in theaters on Friday, November 17. This is an interesting development and one that has some ramifications when it comes to Justice League. As DC fans are exhaustively aware, both Batman V. Superman: Dawn of Justice and Suicide Squad were plagued with poor reviews, meaning their Rotten Tomatoes scores were quite bad, with 27 and 26 percent, respectively. While Wonder Woman managed to break the DCEU curse, earning rave reviews this year, the jury is out on Justice League. It seems like Warner Bros. is trying to keep a possibly less-than-favorable Rotten Tomatoes score out of the public eye until the last second. Even though reviews are going to be released tomorrow for Justice League, which means fans and moviegoers are going to be able to read the reviews on Rotten Tomatoes and Fandango, the Tomatometer score won't be displayed, as it usually is. That means when people are purchasing their tickets in advance, the Rotten Tomatoes score will have no sway over their decision. Much has been made of Rotten Tomatoes and its potential effect on moviegoers in recent years. While many big movies are destined for a big opening weekend, with or without poor reviews, a good Tomatometer score can keep seemingly a movie, like Wonder Woman for example, going strong in following weeks. Whereas a movie like Batman V. Superman: Dawn of Justice had an incredibly steep drop-off in its second weekend, as word of mouth and reviews weren't doing it any favors. It's likely that Justice League won't have any abysmal Tomatometer score, but it's equally likely the movie won't have a great score either. As noted by VOX, Warner Bros. holds a minority stake in Fandango, which owns Rotten Tomatoes. So they could have been the ones making sure the Tomatometer score doesn't make its way online until the last second. This could set a precedent for other big movies moving forward. It will certainly be worth watching Justice League's performance at the box office. 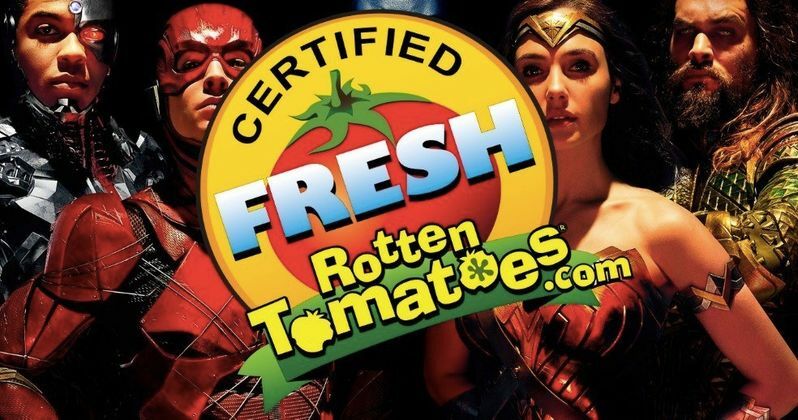 You can watch Rotten Tomatoes See It/Skip It on the Rotten Tomatoes Facebook page on Thursday to see the reveal of the Justice League Tomatometer score.